Every year people ask “so what are you doing different or new this year?”. I think that most times it is just a way to ask about the farm in general. I usually search my brain and come up with a smattering of new tomato and pepper varieties or a new radish but those kinds of changes don’t really make any difference in how Peregrine Farm runs. We (hopefully) are long past any major infrastructure changes, the last major one being the arrival of the Big Tops. No new greenhouses, large pieces of equipment or walkin-in coolers. We are at the point, after 25 years, that we are just fiddling with the knobs and fine tuning things. There is one big change this year though and it is more important to how we operate than any other component of the farm. Our staff. For the first time in ten years we are starting with entirely new help. We have been extremely fortunate to have had a string of great people and every year at least one of them would return for at least a few days a week. The continuity that this provides is wonderful and the integration of new people into the program is much smoother too. But all good things come to an end and our last group all decided to move on at the same time. Joann is finally on her farm full time and we couldn’t be more pleased for her. Rett is starting his new farm near Asheville. Rachel is graduating from UNC and headed out. Will is working on developing his new farm too. Julia decided to stay at home in Wisconsin to work and farm up there. Hired help is the most important single input on intensively managed small farms, both in getting things done but also in cost. Most small farms like ours spend as much as 50% of gross on hired labor! This doesn’t leave much for every thing else and a return to the owners. We have worked very hard (fiddling with the knobs) to reduce this number to less than 20%. We have managed to do this by becoming very efficient in how we do things, not growing crops that take excessive labor, using help only for critical farm related needs and by hiring really good people plus training and paying them well. I am pleased to report that, once again, we have two great people for this year. Elizabeth is from South Carolina but has worked the last two seasons on farms in this area, Elise Margoles’ Elysian Fields and Bill Dow’s Ayrshire Farm. 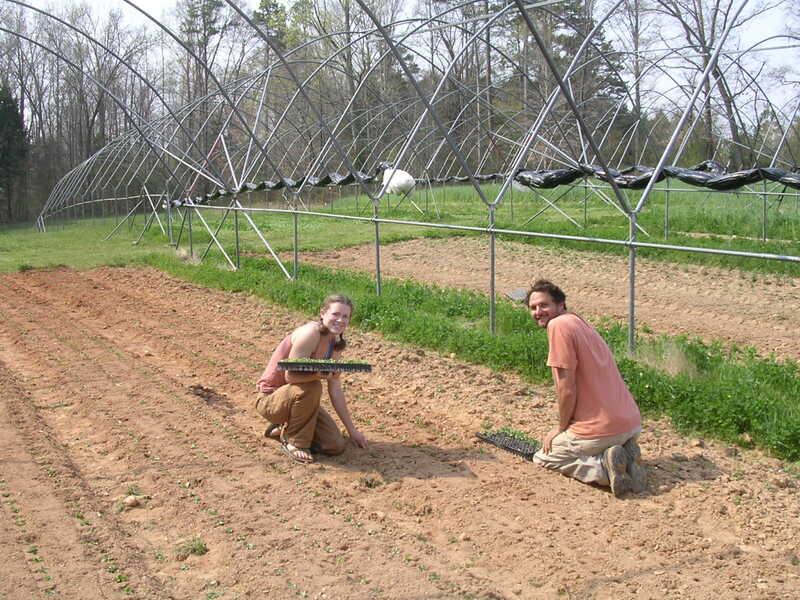 Cov is from Charlotte but traveled widely with stints on farms in California and last year as an intern at the Center for Environmental Farming Systems in Goldsboro. After nearly a month here on Peregrine they have not left running down the road screaming! This is one of those transition weeks on the farm. The first tomatoes went in the ground (in the sliding tunnels) and the last large planting of lettuce was put in too. From now on just about everything we plant will be warm season crops so while we are just barely beginning to harvest the cool season crops our minds are already partly in June. Great rain this morning which will help a lot but we began the process of putting out the irrigation this week. Those high 80 degree days forced our hand. Just about everything on the farm got cultivated and weeded this week and are much happier now. Soon we will have to start putting trellis up to support all those flowers and peas that will grow fast from here on in.